This 300 large piece jigsaw puzzle is designed by Abraham Hunter and measures 18" x 24". Available in two piece count. This 300 large piece jigsaw is designed by Sandy Rusinko and measures 18" x 24". This puzzle depicts a bright red schoolhouse in the middle of the country. Children make their way to the building as a teacher waits by the door to usher them to class. 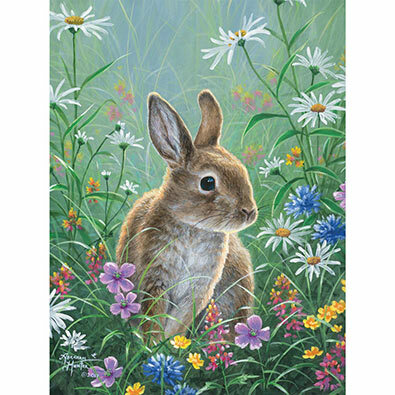 This 300 large piece jigsaw is designed by Adrian Chesterman and measures 18" x 24". Puppies play among the hanging laundry line and splash among the soapy suds. Available in two piece counts. Lakeside Retreat is a 300 piece jigsaw puzzle designed by artist Nancy Wenersbach. A red sailboat is moored at the dock in the back of this charming summer cottage. As the sun starts to set, a black and white dog anxiously awaits more arrivals on the dock. Country Charm is a 300 piece jigsaw puzzle designed by artist Nancy Wernersbach. A country farm stand, flower shop is open for business. Colorful flowers, garden statues, birdhouses and watering cans are all for sale.